Yesterday I found myself near tears in the produce section of my local Publix supermarket. No, I don’t have a strange phobia related to cantaloupe and corn on the cob. Let me explain. For the past 150 years (it seems) I’ve been working on a redesign of Catching Happiness. I’m trying to update its appearance, provide a way for readers to subscribe to posts, and come up with some new goodies for you. These things sound simple, and taken individually they might be, but taken all at once, by me, an impatient, tech-ignorant, semi-perfectionist, they haven’t been simple at all. Just when I think I’ve got one item sorted, some other thing pops up to derail me. I’m in the messy middle. The messy middle is where you find yourself when the first flush of enthusiasm for a project has drained away, and you can’t quite see the finish line and draw energy from being almost done. The messy middle is where it gets…messy. 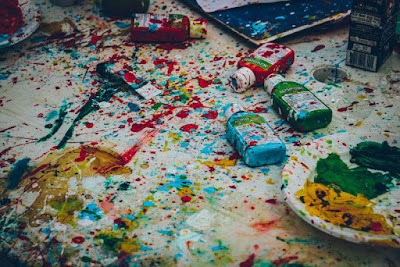 Messy with possibilities, both pursued and cast off, messy with decision-making. There is often confusion. Sometimes there is crying. Or cursing. The messy middle is where fear lives. After taking the afternoon off in favor of grocery shopping and having two cracked teeth repaired at the dentist (if you can call having one’s teeth drilled “taking the afternoon off”), I decided that instead of weeping and tearing my hair out—and writing long, whiny emails to Laure Ferlita—I am going to grit those newly repaired teeth and figure out how to get through the messy middle so I can learn from it, and maybe even find some happiness in it. Take extra care of my body and mind. While I’m stressed out by uncertainty and frustration, it’s important that I eat healthfully (rather than mainlining cookies), get enough sleep, and continue my regular exercise program. I also need to allow myself some downtime so I don’t let the well run dry. Envision the end product. Take a moment to picture what finished looks like, and how it feels. Anyone can persist with what comes easily—how proud will I feel when I stick with it, even though it’s hard? Simplify other areas/streamline. Even though I might be tempted by the next shiny thing, I cannot take on too many different and complex projects right now. I have certain commitments that I’ll keep up with, but I’m not going to undertake any new, major tasks. Seek support. (See: whiny emails to Laure Ferlita.) I don’t have to go it alone. I can ask for help. I stink at this. I hate asking for help, because I know everyone is busy with their own stuff, and I feel like I *should be able to handle this project. However, there is no way around the fact that I can’t handle this project by myself, and I’ve had to reach out for help. And whaddya know? That help has been there. In the past I’ve been guilty of rushing through life to get to the “good parts,” only to find that what I rushed through was the good part. I have a feeling that I’m rushing through this blog redesign just to finish it, rather than taking the opportunity to learn something every step of the way. Laure kept urging me to have fun with the process, and until today, I couldn’t even imagine being able to do that. Are you in the messy middle of anything? How are you coping? Dang! 150 years?! No wonder I feel tired! I promised you once before...if you'll let go of your white-knuckle grip on this and start playing, you will be amazed at how well it will turn out! The same promise holds today. BTW, the messy middle is known by another name. Laure--Well, it FEELS like 150 years :)! Progress being made almost as we "speak." Hope you have some time next week for some (what I hope are) final flourishes! Rita--I think we all have a number of messy middles in progress at any one time. Funnily enough, after writing this I made a big leap forward in the blog redesign. Thanks for your encouragement. Dearest Kathy I have quite a few messy Middles that need to be dealt with...one is working on getting back up files for my photos figured out. I relate to that techie thing...definitely not my forte! :) Good luck with your blog redo. Hugs! Sorry this project has been so difficult for you, but I sounds like you are on the road to finishing it. And I love reading your insights. Debbie--Life seems to be mostly made up of messy middles! Thanks for the good wishes--progress is being made! I'm glad you enjoyed the post, Cheryl, and thanks for the encouragement. This has been a real learning experience, to put it nicely. But I'm getting there.